Last spring in my Digital Literacies and Emerging Technology grad class, we were asked to create a non-linear experience using PowerPoint or another similar tool. In addition to the non-linear format, there had to be a place for discussion. My professor called it a “Branched Simulation” and I called it the bane of my existence. There were many false starts and initial sketches until I found my way forward. For this interactive experience, I used a lesson from Facing History about the political parties during the Weimar Republic. 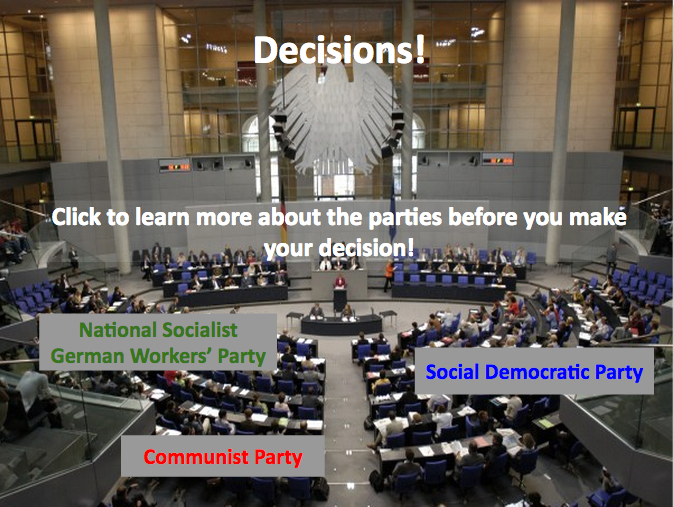 The lesson looks at the political platforms of the Communist Party, the Social Democratic Party, and the National Socialist German Workers’ Party. In this experience, students were job seekers attempting to help the political parties recruit. In the plan, students utilize TodaysMeet to participate in a discussion regarding the parties and also respond individually. Initially, I created this in PowerPoint as this was not possible in Google Slides. As I teach in a “Google school” students did not have access to PowerPoints which meant that this project was sadly filed away in my “Ideas” folder. (Though, I often took it out to think about the “what if” scenarios.) At dinner one night, a colleague told me about creating an interactive Jeopardy board on GoogleSlides. It did not take long for me to figure out that a GoogleSlides update would finally make this possible. To make this a more interactive experience, I also use TodaysMeet. This allows for students not to simply click through the experience on the presentation, but to become more active participants. Students are to, based on the political party platforms, create campaign slogans for each of the three parties discussed. At the end of the experience, they reflect upon the slogans of their own creation and others. They then are asked to find support for a few other of the slogans. For purposes of the longevity of this blog post – as TodaysMeet rooms may only stay open for a year – I will eventually transition into this into in a non-expiring GoogleDoc. This is the presentation (if there is a big white spot, it is loading). It is set to advance slide every minute, but once you start clicking, you are in control of it. Go ahead. Take it for a spin. Let me know what you think! You can travel through this presentation on your own device – whether it is a laptop, or an iOS device [it may work on android devices, I just haven’t rested it out]! So finally, I can share this with my students and you, dear reader. These are the parties that students will examine! They will look at the Party Platforms during the branched simulation. To create this presentation, I made links to the other pages. There are 49 pages in all, and it did take some work to think through the process, test it out, and improve on the experience. I actually drew this out on paper prior to getting started as I had to think through the process. As I described earlier, play testing was extremely important. Even after the play testing, after having a classroom of students working on it, I quickly adapted it as well. I did find – and this may have just been our bandwidth – that having 24 students on it at once was difficult. To fix this, I had students complete this in pairs, though they answered the final questions individually. This activity absolutely thrills me. The non-linear format which puts students in the driver’s seat has such potential and I’d like to devote more time to creating these experiences. Again, try it out and let me know what you think! *On a personal note related to this, while I’m currently a bit overwhelmed with graduate school and teaching (also various committees and historical improv/sketch), I’m looking forward to graduating with a Masters in Curriculum and Instruction this summer, mostly so I can have time time to create more non-linear experiences. Also to go on a weeklong hike. This entry was posted in Uncategorized and tagged 1:1, education, Google Slides, History, Interactive Learning, PowerPoints, Social Studies, Teaching, Weimar Republic. Bookmark the permalink. This is really good, Michael. i am going to share it with my Social Studies friends. This is an incredibly immersive way to teach about a subject that can be slightly boring [in comparison to the fireworks that happen after]. Well done, this is the type work that I am striving for.